Made by Maruku Arts in Uluru, Northern Territory, 1999. The Ngintaka (goanna) is flat with a rounded top, tail and four small legs. The Ngintaka is decorated with patterns burnt into the wood. Burnt into the underside of the object "O". Inscribed onto underside of the object in green pencil "WH180"
Topsy Tjulyata began working in arts and crafts at Ernabella in the late nineteen forties and by the eighties had specialised in wood carving. She works closely with her husband Walter Pukutiwara, and after helping establish Maruku Arts is still a Governing Committee member. Topsy is one of the most expert and widely exhibited Maruku carvers and marks her work with a signature circular walka. 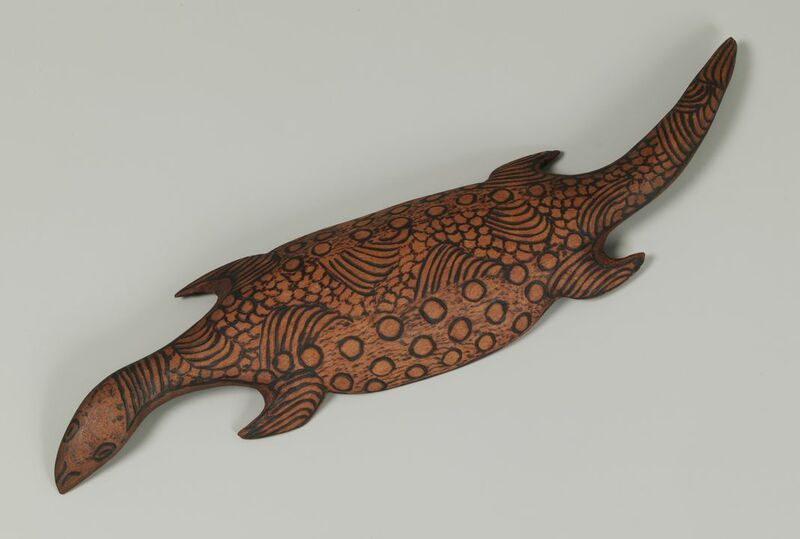 Contemporary carvings by Anangu (Central and Western Desert Aboriginal people) are known as punu, hand carved and decorated with walka, patterns burnt into the wood with wire heated on a wood fire. The animals all have their associations with the Tjukurpa, the stories of the Creation Ancestors and the activities which shaped the land, the people and their Law. Tjukurpa is celebrated in inma (ceremony, song and dance), story telling and art work. Many of the details of Tjukurpa are restricted to senior custodians. The Ngintaka or Perentie lizard (Varanus giganteus) is the largest lizard of Central Australia and a highly prized and important food. Wati Ngintaka (Perentie Man) Tjukurpa stretches from one side of South Australia to the other, many sacred sites marking his passage from the first greedy sighting of a prized grindstone, to his death in punishment for its theft. Ngampal ngaranyi is lying 'flat out' on the ground in the typical flattened pose of a sun basking lizard. It is an adaptive habit of many reptiles to use the sun and hot ground to increase their body temperature by forming as large a surface area as possible.